Originally published March 22, 2018. In March of 2009, I had the "good fortune" of experiencing a catastrophic house fire. My husband and I had built our dream cottage on West Harbor a couple of years earlier. It was a lovely, two-story Cape Cod style home, with all the latest upgrades and each room was beautifully furnished and decorated as if it were lifted from the pages of Coastal Living Magazine. Luckily, no person or pet was hurt, but the fire occurred on a windy night in early spring, fanning the flames quickly out of control, burning our house down to the ground in just 45 minutes, and taking several of my neighbor's homes along with it. That event served as a "teachable moment" for me. It forced me to explore and accept the yogic ethical practice of "non-possessiveness" and the idea that whatever is given, can also be taken away. It is the nature of all things to change. If there's something you dislike in your life, change is coming. If there's something you absolutely love in your life, change is still coming. No matter how good or how bad a situation is, it will change. The key in life is not to get attached to any of it - good or bad. My friend and fellow yogi, Kathleen Tuthill, has a great saying: "Happiness is a pause between two problems." Her philosophy is reinforced in the best-selling book, "The Purpose Driven Life." Author Rick Warren reminds us that "life is a series of problems; Either you are in one now, you're coming out of one, or you're getting ready to go into another. The reason for this is that God is more interested in your character than in your comfort." In the decade that followed that devastating house fire, I've have many more "teachable moments" on change and non-attachment. Most recently, with my health and breast cancer. And now that I've ended four months of chemotherapy treatments, I am once again practicing non-attachment with my medical team. 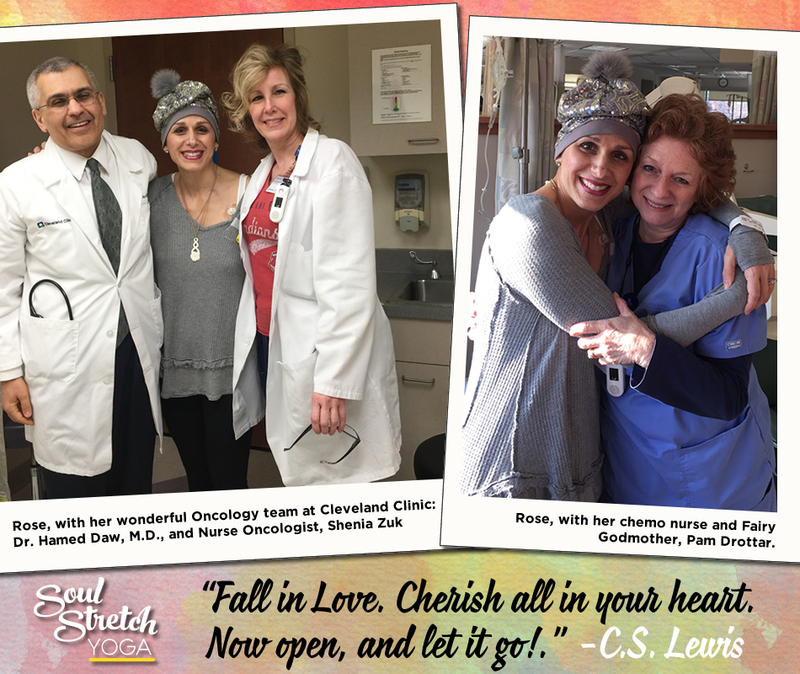 For those of you who've had cancer, you understand the relationship with your oncologist, oncology nurse and chemo nurse is sacred. I adore and trust my team. They kept me focused and positive while on my path to wellness. I saw them every other Thursday for 16 weeks and I actually looked forward it! But, I could also see that at some point, all the appointments, lab work ups and infusions would come to an end. The final infusion came last Thursday, March 15th. And in addition to feeling joy, relief and happiness, I also feel sadness, fear and uncertainty. Now is when I must, once again, put my yoga into motion and replace fear and control with faith and flow. I must let it go even though it feels very much like I'm a trapeze artist, suspended in mid-air with nothing to hold on to. I would much prefer to let go when I know for sure what the future holds. But the hope of a pain free tomorrow is promised to no one. My job in the now is not to cling to anything - even my cancer care team. All I can do is live in the moment and let the experience teach me. May YOU too, learn to live by the words of Yogi, Sri Swami Satchidananda; "Whatever comes, accept it. Whatever goes, accept it." 3865 E. Wine Cellar Rd. at the Historic Mon Ami Winery at Catawba Island. The first NamaSlay Cancer event took place in January 2018. We are blessed to bring this special event back.